Office hours Monday to Friday 10am -8pm. Sat 10am-4pm. A dermatoscope uses a high quality lens for 10 to 14-times magnification and a lighting system which enables visualization of subsurface structures and patterns. 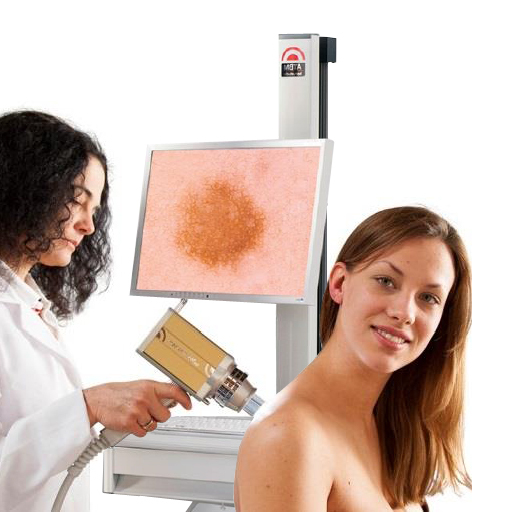 Dermatoscope helps dermatologists to distinguish benign from malignant (cancerous) lesions, especially in the diagnosis of melanoma - the most serious skin cancer. All excisions by Dr Madan, a highly trained skin surgeon, on special register of GMC. Our 2-Step process of mapping your entire body allows us to identify and treat single or multiple moles. Pattern recognition and specialist training allows our clinical staff to differentiate benign (harmless) from dysplastic (abnormal) moles and melanoma (skin cancer). You will receive a password protected USB drive with photographs of the moles. What is Automated Total Body Mapping? Mole mapping refers to cataloguing moles on the entire body. Traditionally, patients who have lots of moles, with or without a family history of skin cancer can have their body moles photographed and then reviewed by the dermatologist in 6-12 months against those baseline photographs. The dermatologist will then be able to see any changes in the moles and may suggest excision of any altered or newly developed mole – a rather cumbersome technique. The traditional mole mapping technique has been superseded by the latest ATMB system from Fotofinder. ATBM stands for Automated Total Body Mapping. 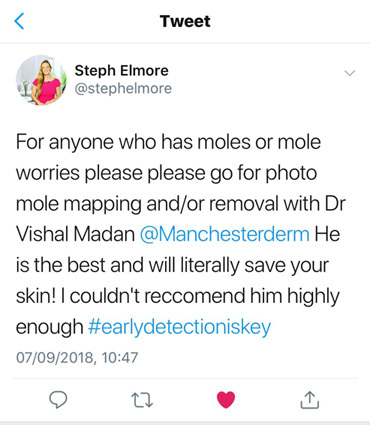 We now offer this automated technique of mole mapping employing sophisticated software which enables identification of all the moles on the body, allows very high quality digital and dermatoscopic photographs to be taken of any odd appearing mole. During the follow-up appointment, the process is repeated and any change in previous moles or presence of a new mole is quickly and efficiently highlighted by the ATBM system. Early diagnosis is the key to a good outcome in skin cancer, melanoma. How is the mole map clinic different? 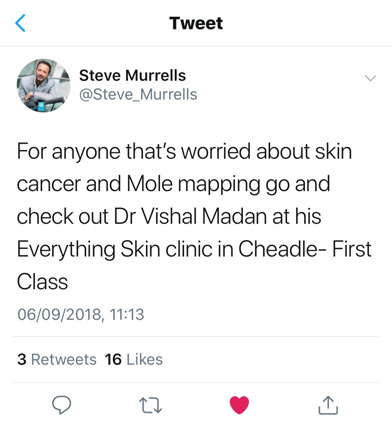 Whilst mole mapping service is offered in a few high street clinics, unfortunately, they lack the clinical expertise to make the diagnosis of melanoma and would resort to referring the pictures to a dermatologist for their opinion. Further, if the mole is deemed to be abnormal, the patient would then be referred to another doctor for it to be removed. At Dr Madan’s mole map clinic at The Everything Skin Clinic, we offer a unique, streamlined 2 step approach in mole mapping. All patients are seen and examined by a fully qualified consultant dermatologist. All moles and their dermatoscopic features are examined by the consultant. We believe that time is precious and patients deserve a speedy diagnosis and treatment. With this in view, we will offer to remove any suspicious mole within a week of diagnosis. Click HERE To find out more about dermatoscopy. One off cost for full body mole check and ATBM check is £350. Mole removal is covered by all insurers. Self pay prices will be discussed in clinic and depends on number of moles removed and analysed by specialist pathologist. Treating patients from across the UK and locally including Manchester city centre, Bolton, Bury, Cheshire, Stockport, Wilmslow, Alderley Edge, Bramhall, Prestbury, Cheadle Hulme, Rochdale, Warrington, Irlam, Macclesfield, Knutsford, Preston, Liverpool, Buxton, Salford, Hulme. at Haw bank House, Cheadle, Cheshire, SK8 1AL. Dr Vishal Madan, MBBS (Hons), MD, FRCP is a Consultant dermatologist, Laser and Dermatological surgeon at the Salford Royal NHS Foundation Trust and Honorary Senior Lecturer at University of Manchester. After completing the Addenbrooke’s Cambridge medical rotation in 2004, he undertook his specialist training in Dermatology in Manchester. He did two fellowships- one in Laser Dermatology at the Salford Royal NHS Foundation trust and another in Mohs micrographic (Skin cancer) and reconstructive skin surgery at the Welsh Institute of Dermatology, University Hospital of Wales, Cardiff. Dr Madan has published 110 scientific articles, authored 10 book chapters and edited a book on specialty examination in Dermatology and another on skin cancer. He has been an invited reviewer for 11 international journals and has made 70 scientific presentations.